200 years after his birth, much of the music of Robert Schumann remains to be discovered. For apart from a few songs, piano works and concertos, the four symphonies, and a handful of chamber works, his music is hardly known today to the public. Among the treasures reaming to be discovered are the a cappella choral songs. Schumann himself considered his choral music highly. The raison d'être for the composition of his Romances and Ballads was a result of his conducting activities in Dresden in 1847, during which time Schumann was the musical director of two of the city's choirs. In the selection of texts, Schumann shows his typical poetic sensibility. However, here, he deals with rather less subjective issues than the deeply confessional nature of many of his lied. Vocally, however, these pieces are by no means easy. They display a wide range of musical structures and are sophisticated, subtle music. 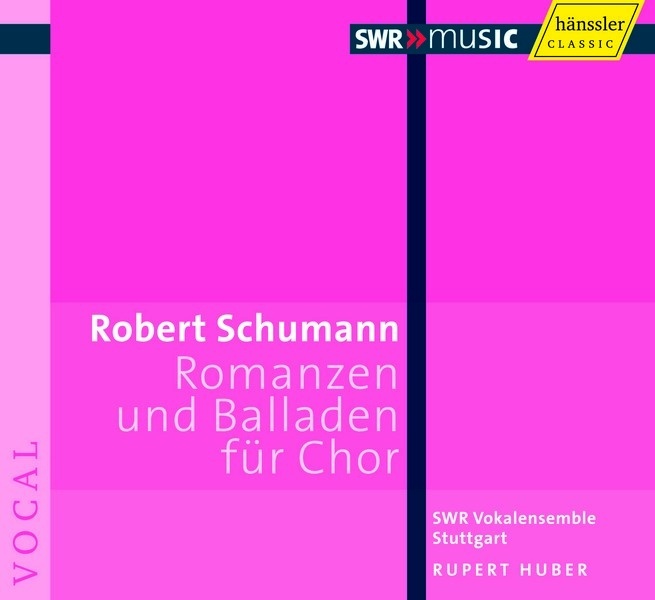 The Vocal Ensemble Stuttgart - regarded as leaders in performance of contemporary choral repertoire, demonstrate that they are more than equal to the expressive demands of Schumann's High Romantic idiom. This is a welcome release with which to celebrate the "Schumann Year."